"I know why we're so peaceful. Because all three of you are nuts." I have to admit that the news of Disney releasing My Neighbors the Yamadas surprised me. I never imagined that an animated film as low-key and distinctly Japanese as this one would see a release from a big studio, but I am happy to see it nonetheless, as it's a funny, warmhearted look at families and what makes them tick. Yamadas, directed by the great Isao Takahata and based on a comic strip by Hisaichi Ishii, looks much like the original strip, but the film carries it a step further by making beautiful use of impressionistic backgrounds and pale, watercolor-like colors. It's a striking look and suits the film's diffuse nature. There isn't a plot, per se; instead, the film collects several vignettes and gags together under different "chapter" headings, each section punctuated with a haiku, read by a narrator and written onscreen. The material covers a range of emotions and stories wrapped up in being part of a family, with the good, the annoying, and the ridiculous in equal portions. The film opens with a lovely sequence showing Takashi (Toru Masuoka/Jim Belushi) and Matsuko (Yukiji Asaoki/Molly Shannon) beginning their life together, set to a toast given at their wedding. It encapsulates the film's message, telling us that life may be difficult, but families that stick together will make it through somehow. The imagery used in this sequence features nods to Japanese folklore that will probably be lost on most American audiences, such as Momotaro (a boy born from a peach) and Kaguya-Hime (a girl born from a bamboo stalk). Once that fantasy-inspired opening is done, though, we see life as it really is, full of silliness, selfishness, and putting up with each other. The characters are not particularly unique; Takashi is the typical salaryman, going to work and struggling to stay in charge of his family. Matsuko, the mother, is slightly dotty, and not a particularly devoted housekeeper; the grandmother, Shige, is a bit crotchety, and the kids, Nonoko and Nobuko, are your typical kids. What makes them click as a unit within the film is their reactions to each other and their situations; they are in many ways typical of many of us, and we can subsequently identify with them. As a result, some will find this film boring in the extreme, because they don't go to movies to see the mundane depicted, but it's their loss. The two casts, Japanese and English, do a fine job. I was very leery of the English track, given my general loathing for just about anything with Jim Belushi, but he does okay as Takashi. Molly Shannon is good as Matsuko, and the overall tone stays true to the original, which is important given the nature of the film. Like most anime enthusiasts, I am a big fan of Hayao Miyazaki's work, but in many ways, I enjoy Takahata's work even more. 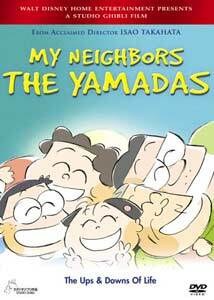 My Neighbors the Yamadas is just another example of Takahata's craftsmanship and varied output, and shouldn't be missed by fans of anime and film fans in general. Image Transfer Review: The Japanese release of Yamadas featured an anamorphic, interlaced transfer, and Disney has upgraded that to a progressive transfer. It looks clean and sharp, though some slight edge enhancement is occasionally visible. Otherwise, the pale, watercolor-inspired palette looks very appealing. Audio Transfer Review: One way in which the Japanese release is superior is its inclusion of a DTS track for the original Japanese soundtrack, but the Dolby 5.1 tracks in English and Japanese are included here. This isn't a movie with a lot of varied sound effects, being mostly dialogue and occasional music, and both tracks serve equally well, depending on your language preference. Extras Review: Depending on your interests, you may find something of appealing here, or nothing at all. The main extra is a collection of storyboards for the entire film, their usefulness related to your interest in the crafting of animation. It's a nice addition, but I really can't see sitting through these page by page. Animation students will, I assume, appreciate them. The other extra of note is Behind the Microphone (05m:31s), which has interviews with the main English cast members, Jim Belushi, Molly Shannon, Daryl Sabara, and Liliana Mumy, and scenes of them performing in the studio. At just five minutes and change, it doesn't overstay its welcome and is entertaining for what it is. Finally, there are 16m:09s of trailers, TV spots, and promotional films, which are chaptered for easy access. Subtitles are provided for the onscreen text and dialogue, though the widescreen trailers are not anamorphically enhanced. If you thought anime was all about demons and big-eyed gun-toting babes, check out My Neighbors the Yamadas for a film to help you dispose of those stereotypes. Disney has done a good job on the DVD, and even provides a pretty solid dub soundtrack.